You want to give your kids the attention and care they need while you provide for your family and work professionally. How do you balance a career and a family? “When you do what you love and keep doing it intentionally, someone will eventually pay you for it,” she went on to explain. Giese is a committed SAHM, but she didn’t just spend her time at home driving kids to soccer practice and doing six loads of laundry a day — she used her “home time” to develop marketable skills. Giese began an at-home business and began writing professionally. Many SAHM’s believe that they’ve kissed their careers and hard-earned educations goodbye when they choose to stay at home with the kids, but nothing could be further from the truth! Like Stephanie Giese, you can work from home, develop your talents, interests, and skills, and keep your professional edge. Below, we’ve got 7 tips for successful SAHMs who choose to work from home. 1. Kill the guilt when you begin working from home. You may experience some “mommy guilt.” Many stay-at-home-moms feel like they aren’t fulfilling their parenting responsibilities because they take time for themselves or their business. Remind yourself that you can be a fantastic mom and business woman at the same time. 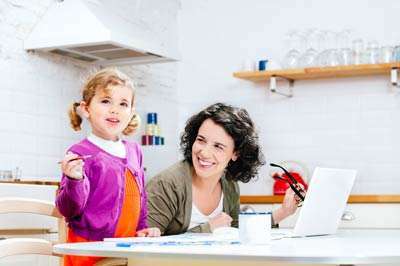 Mothers who work at home report feeling happier and more purposeful, so you’ll be a better mom as you keep yourself engaged in the professional world. 2. Set expectations. Your kids need to understand your expectations for them while you work. Talk to your kids and set certain boundaries during “work time.” For example, some moms use a code word. Their children understand that when they use the code word they’re asking for mom’s total attention, but that means that the interruption has to be legitimate. You also need to understand your expectations for yourself. While you work from home, you’ll experience lots of interruptions and unexpected setbacks during the day. Remember: interruptions and setbacks exist in the office, too. Set realistic expectations for yourself and remind yourself of them when you get overwhelmed, stressed, or frustrated. 3. Dare to try. As you spend at home with the kids, explore new talents and interests. Stephanie Giese began to blog, and rediscovered her love for writing and communication. Today, she’s a published author and popular blogger. Another SAHM saw a need in her community for better math teachers. She used her degree in accounting and former career in education to begin an after-school math tutoring program. Now she’s the owner of a successful tutoring and college preparation center. Use your education, past experiences, and current interests to develop new skills and discover opportunities. When you pursue what you love, you’ll find you have time to develop your skills as both mom and businesswoman. 4. Continue education. Parenting is compelling, important work, but many moms find their college education or vocational training is largely inapplicable as they change diapers and cook mac-and-cheese. But you don’t have to lose the skills you’ve worked so hard to gain. Continue your education by taking a class from your local university, reading books in your field, and participating in various local and professional training courses. 5. Start your own home-based business. Many SAHMs find that starting a business they can manage from home provides numerous benefits. They contribute to family finances, keep a professional edge, and learn new skills, while still being available for the kids. Explore things that interest you and needs you see in your community. Choose a field that allows you to work part-time and at odd hours, like eMerchantClub. 6. Use a third party to manage logistics. Some companies provide inventory, websites, technical support, and other resources so you can focus on making your business succeed. Busy stay-at-home, working moms usually don’t have time to micromanage every logistical detail of their business, so include a third-party company in your home-based business. 7. Work odd hours. Many SAHMs say they’re most productive in the early morning while the kids are still asleep. Try waking up a few hours before your kids, and fit in another hour of work after the kids have gone to bed in the evening. These uninterrupted, quiet hours help you get things done quickly without worrying about where your three-year-old went with the jar of peanut butter. Take charge as you explore the many professional opportunities available to you as a SAHM; you’ll realize that, just like Stephanie Giese said, you can have your cake and eat it, too. You’ll love spending time with your kids at home and continuing your career without sacrificing your ability to prosper in each area.